Email is a great way to reach out to a prospect … IF (and only if) you are able to get the prospect to do three things: 1) open the email, 2) read the email, and 3) respond to the email. Of course, that’s usually easier said than done. If location, location, location are the prime rules of real estate, then personalization, personalization, personalization are the prime rules of email. 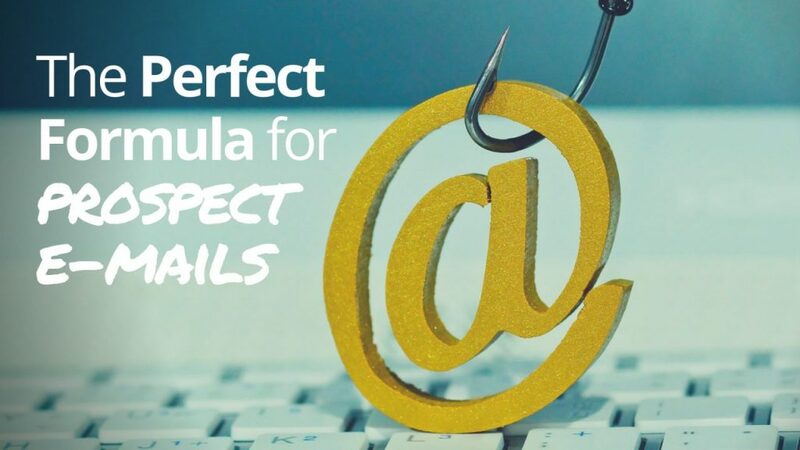 If your email even hints at the chance that it’s a mass email or generated by an auto-responder, your chances of your prospect even opening (much less responding to) your email are severely diminished. In today’s world, you simply must put in some effort to know a little bit about your prospect before you compose and send your initial email to them. Personalized will beat out generic every time! Your best source of information is your referral source. But if you failed to get much from them, or you’re not working from a referral, then take some time to look at their website (including their profile and the “about” page), as well as their LinkedIn and Facebook profiles. You know how some of the snail mail that you receive has text on the outside of the envelope to teases you into opening that piece of mail? So too, the email subject line has one primary purpose… to get the recipient to open the email; to create curiosity, to show you know a little about them, and/or to promise some personalized value. Sending a compelling email that isn’t too long is not an easy task. It takes practice. It’s also very helpful to have someone else look at your message to find ways to say the same thing with fewer words. Remember – 50% of the population will see your email on their mobile phone first. Even a short email looks like a book on a mobile phone. Each part of the email is a paragraph consisting of one or two sentences with a space in between each paragraph. No dense paragraphs, please! Make the text friendly to the eye, so people will actually read it (or be able to skim easily). Open your message with something that you learned about the prospect and/or their business. This can come from your referral source or other research. I/we work with ______, who want to ________ (and ________). For example (see next paragraph). Provide a short example of a success you had with a client with whom they can identify. What do you want this person to do? Whatever it is, ask them or tell them. They can’t read your mind. For myself, my first Call to Action (CTA) is usually a request for a short (15-minute) phone call. I like to tease some value that will come from that call, such as telling them about what other clients are doing that’s working or that I can send out latest study or E-guide. After your Call to Action and valediction (a fancy word for complimentary close), consider added a P.S. If someone skims your email first, there’s a strong chance they will see and read your P.S., before they actually read the main message. Typically, the P.S. is used to reinforce an important point made previously or add a new, compelling, piece of information. NOTE – I sure hope you’re not using AOL or Hotmail for your business email. A business email from these services screams “Amateur!” Gmail, Yahoo and similar services are a little better. But, if you really want to look like the credible professional that you are, use an email service that allows you to put your name or company name after the @ sign. What creative, possibly fun, and definitely effective method have you used to reach qualified prospects and convert them into clients? I really want to know! Let’s “share the wealth” of ideas!